Undoubtedly, we will hear how Industry City’s proposed Special Sunset Park Innovation District, which entails the development of two hotels, academic space, and expanded retail, will create opportunity for neighborhood residents and small business owners. We will hear that Industry City tenants have already created thousands of jobs and that the Innovation Lab is connecting hundreds of Sunset Park residents to these jobs. Despite a community advocate and blogger’s repeated requests for evidence to substantiate these claims, Industry City has not yet shared any supporting data. 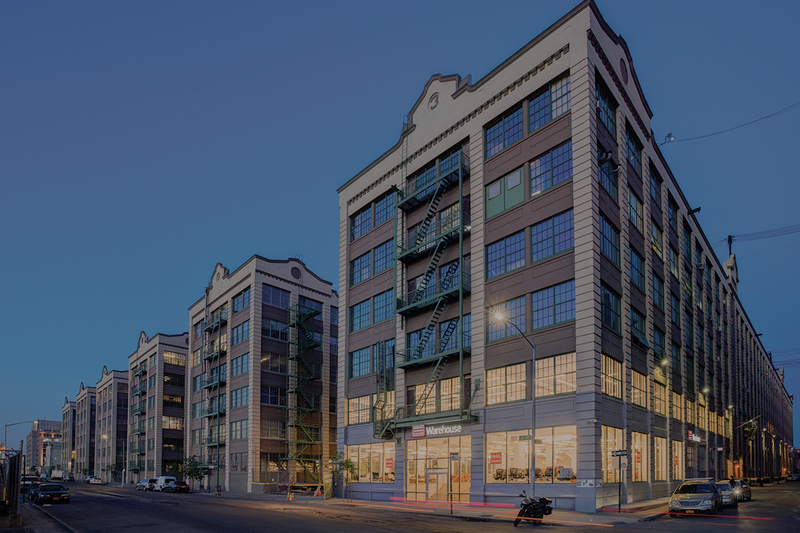 Kimball will likely elaborate how Industry City’s rezoning advances Community Board 7’s 197-a plan, “New Connections, New Opportunities,” adopted by the New York City Council in 2011. He will most likely bring out Industry City tenants, perhaps the same ones who attended my presentation at the October 1 town hall, to testify about Industry City’s positive community impact in cleaning up the waterfront and assisting local small business owners. He may also discuss Industry City’s recent tri-lingual mailer publicizing its website. The mailer includes a pre-paid, addressed form [to Atlas Direct Mail] for recipients to simply check boxes and return stating their support for Industry City’s proposed plan. Since the mailer lacks any detail on the rezoning proposal, its emphasis on opportunity feels like a cheap gimmick to win the support of a community in need of meaningful employment with livable wages. While substantive, long-term benefits to Sunset Park’s working class and working poor communities are questionable, the scale of real estate speculation and private investment unleashed by Industry City’s reactivation and related public relations hype is not. Kimball notes the rezoning will facilitate a $1 billion investment and add 1.3 million square feet of new development to Industry City by 2026. In a July 2017 Progressive City article, I documented Kimball’s affinity for transnational capital in his public and private roles as a steward of Brooklyn’s industrial properties. I detailed Industry City’s recapitalization of its mortgage with a massive loan from the Bank of China [one of China’s “Big Four” state-owned banks] with more capital to be distributed over time as Industry City is renovated and leasing goals are met. At a September NYC EDC development finance conference, I learned Sunset Park is targeted for more infusion of private capital. A panel titled, “Beyond Bonds: New Investment Tools Catalyzing Growth,” introduced Opportunity Zones – a federal census tract designation created by Trump’s 2017 Tax Cuts and Jobs Act. Trump’s tax cut act provides a historic reduction in the corporate tax rate as well as lowered taxes for high net worth individuals. Through Opportunity Zones, the wealthy can defer capital gains taxes by investing in businesses or property development in “economically distressed” communities defined as census tracts with a 20 percent or higher poverty rate and a median family income no greater than 80 percent of the area median. Sixty percent of New York State’s 514 designated Opportunity Zone census tracts are located in New York City. The highest concentration of the city’s Opportunity Zones is in Brooklyn [with 125 designated census tracts] and many are clustered in the “key areas” of Sunset Park and the Brooklyn Navy Yard. Eleven Sunset Park census tracts are designated Opportunity Zones. While the bulk of Industry City’s massive 16-building complex is located in census tract 18 which is not an Opportunity Zone, surrounding waterfront census tracts that include two Industry City block lots - Block 695, Lots 20 and 43 – are designated Opportunity Zones. Most notably, census tract 2 is an Opportunity Zone and includes Block 695, Lots 20 and 43, as well as six properties that Industry City intends to acquire and demolish for its proposed 12-story Gateway Building with ground floor retail and 11 stories of hotel space. These six properties – 950, 952, 954, 956, 958 and 960 Third Avenue – are located between 36th and 37th Streets and, according to the city’s building classifications, they are primarily two-family buildings with ground-level retail. Census tract 2 exemplifies the defining criteria of an Opportunity Zone with a poverty rate of 31% and a median family income of $46,964. Moreover, the census tract’s 1,600 residents are majority Latino (90%), renters (82%), and lack a high school diploma (59%). Opportunity Zone designation, however, will mean opportunity for private investors to benefit from tax breaks by underwriting Industry City’s hotel and retail Gateway development. Sunset Park’s Opportunity Zones will supercharge the gentrification already taking hold in and around Industry City. In addition to the waterfront, Sunset Park’s census tract 118 includes two proposed mega-developments on 8th Avenue and is also a designated Opportunity Zone. One of the proposed projects is the Eighth Avenue Center adjacent to the N subway station. Community Board 10 and Sunset Park stakeholders have already expressed opposition to this “ginormous” development. Directly across 8th Avenue is another huge development site that involves the sale of MTA air rights. Developers will surely benefit from the Opportunity Zone designations and the potential infusion of financing for their luxury housing, hotels, and commercial real estate projects. Industry City and Eighth Avenue Center’s rezonings will undoubtedly catalyze transformative neighborhood change. Augmented by Opportunity Zones, Sunset Park is facing a potential financial superstorm that will supercharge gentrification and displace the multi-racial, multi-ethnic working class populations and small businesses including industrial businesses that have long defined this neighborhood. Gotham Gazette and New Leaders Council -- a nonpartisan, nonprofit leadership institute -- have partnered with Manhattan Neighborhood Network to create a series of video commentaries by New York City civic activists. GothamTalks is short video essays submitted through the New Leaders Council alumni network, which consists of hundreds of New Yorkers working in advocacy, government, campaigns, nonprofits, business, law, and other aspects of city life. Like both the reporting we do at Gotham Gazette and the written op-ed columns we publish, the GothamTalks video commentaries range in subject, but are all meant to move the public discussion forward. Please watch, listen, and let us know what you think. Use #GothamTalks on social media, and tag us @GothamGazette and @NLC_NYC. Note: The views expressed in GothamTalks are entirely those of the commentators, and not of Gotham Gazette or New Leaders Council. Independent small businesses -- bodegas, pizza joints, shoe repair shops, fruit vendors -- are the heart and soul of New York City. But they are facing a crisis. Every day there is another story about some beloved neighborhood shop closing due to skyrocketing rents. Landlords then warehouse the vacant spaces in hopes of signing a lease with a bank or big chain. WNYC recently counted 17 vacancies on just two blocks of Christopher Street. And a report by the Manhattan Borough President found almost 200 shuttered storefronts on Broadway alone. What is Mayor de Blasio doing to fix this problem? Nothing. When asked about it -- and he frequently is -- the mayor claims the government’s hands are tied because the “free enterprise” system alone controls what landlords do with their space. The mayor had no real comment on a package of reforms unveiled last week by USBnyc, a new citywide coalition of small business owners, most of them immigrant-owned. And a couple months ago, speaking to Tony Danza, actor and owner of a 125-year-old cheese shop in Little Italy, the mayor’s only solution to the problem was to “urge the landlords to be less greedy.” Good luck with that! But, in fact, the city is not a passive observer - it actively supports large landlords to the detriment of small business owners. 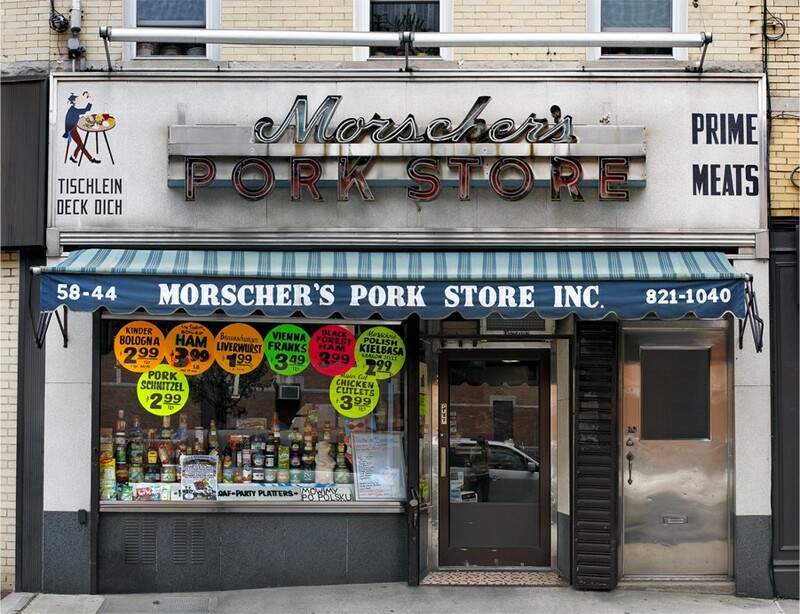 For years, the main priority of the city’s Department of Small Business Services has not been to help mom and pops, but to organize and support Business Improvement Districts, the somewhat mysterious, quasi-public organizations that exist across the city, from Montague Street in Brooklyn to Melrose in the Bronx, with more being created each year. SBS spends more of its yearly budget fostering BIDs (what it calls “neighborhood development”) than it does supporting actual small businesses. Just last month, the city doled out $500,000 for BIDs to create mobile technology apps. And all that is apart from the millions in funding that BIDs receive each year from the City Council. The BIDS have innocuous-sounding names like the 82nd Street Partnership and the Village Alliance. Their glossy annual reports invariably show smiling shopkeepers and kids frolicking in fountains. Usually they are structured to give some minority of votes to local commercial tenants or residents. But make no mistake: by law, BIDs are controlled by commercial real estate landlords. Their mission is to maximize the cash flow they receive from their valuable investments. If that means kicking out a 50-year-old beauty supply shop to replace it with an artisanal gelato chain, too bad. As Mayor de Blasio would say, that’s capitalism at work. It’s true that New York neighborhoods are always in flux, and too much nostalgia can be dangerous. But it wasn’t always like this. BIDs have only existed in New York for about 30 years, since the Union Square Partnership was founded in 1984. With the city in financial distress, landlords sought permission to tax themselves to provide basic services, like sanitation and security, where the city was falling short. Who could refuse such an offer? Even as the city rebounded during the Giuliani and Bloomberg eras, the city pushed for BID expansion, boosting their number to 44 in 2002 and 73 today. And the trend continues under Mayor de Blasio, who blessed new BIDs in Springfield Gardens, Queens and New Dorp, on Staten Island. But BIDs don’t just power-wash sidewalks and post security guards on the corner. They play an active role to advance the interests of real estate owners in shaping public policy. They attend Community Board meetings, hire lobbyists, and nurture relationships with elected officials. With a collective budget in the hundreds of millions, they have a powerful voice. For years, together with the Real Estate Board of New York, they have blocked the Small Business Jobs Survival Act, which would require landlords to sit down and talk with their commercial tenants before doubling or tripling their rent. And, so far, the BIDs have stalled the Street Vendor Modernization Act. In October, no less than a dozen BID managers personally testified against the vending reform package in City Council chambers, while their lobbyists shook hands with officials in the hallway. Everyone, of course, has a right to testify. But it’s time to have a public discussion about whether, as some have suggested, BIDs have outlived their usefulness. New Yorkers today are concerned about gentrification, not “white flight.” It’s time for a neutral study of whether BIDs lead to unfair distribution of basic services and the privatization of public space. And time to ask Mayor de Blasio why, if he cares about mom and pop small business owners, his administration continues to tip the scales in favor of the very same real estate companies that are driving them out. Sean Basinski is director of the Street Vendor Project at the Urban Justice Center. On Twitter @SeanBasinski. The 15 neighborhoods that experienced the highest rates of gentrification in the city between 2000 and 2015 showed a monumental increase in new businesses and job growth but with an inequitable distribution of the accompanying benefits, according to a new analysis released Tuesday by Comptroller Scott Stringer. Stringer’s first-of-its-kind report, titled “The New Geography of Jobs: A Blueprint for Strengthening NYC Neighborhoods,” looked at economic activity in 15 gentrifying neighborhoods and examined trends in employment and entrepreneurial activity by industry, age, racial and ethnic groups. The neighborhoods were those identified by the NYU Furman Center in an analysis of 55 “sub-borough areas” in 2015. Of these, 22 were classified as lower income and 33 as higher income. The gentrifying neighborhoods were those that were lower income in 1990 and had experienced rent increases beyond the median neighborhood. “We need to create an economy based on fairness,” Stringer said, speaking at the Chinese-American Planning Council on the Lower East Side. 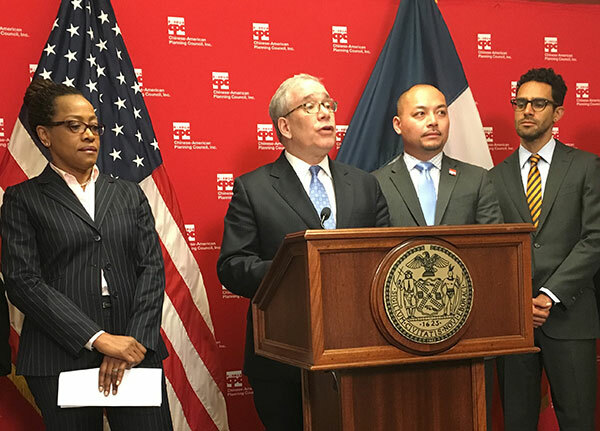 Stringer cited CPC’s work in the Lower East Side Employment Network, a successful workforce development approach that he said should be the model for other neighborhoods. “We want to be able to lift up all groups of people and everyone in our communities. I believe this is about the need to support the idea of local wealth creation and we can only do that with innovative, collaborative and community-centric solutions,” the comptroller added. As economic activity increases in previously under-developed and lower-income neighborhoods, Stringer believes, the resulting opportunity, profits, and benefits should be experienced more evenly by all groups of residents. The number of businesses in the city grew from 203,698 to 237,198 in the 15-year period, the report found, with increased activity in the boroughs outside Manhattan. In Downtown and Midtown Manhattan, which have traditionally seen large concentrations of the city’s economic activity, the share of total businesses fell from 39 percent to 31 percent. But in the 15 gentrifying neighborhoods -- which include East and Central Harlem, Bedford-Stuyvesant, Crown Heights, Prospect Heights, Bushwick, Sunset Park, Brownsville and Ocean Hill -- there was a 45 percent increase in the number of businesses from 29,132 in 2000 to 42,261 in 2015. Although lower income communities saw greater growth than higher income districts across myriad industries, that growth was unevenly distributed. The report notes that while people of color own 34 percent of the city’s businesses, an uptick from years past, their share in the city’s overall economy, 16 percent of revenue and 21 percent of employment, remains relatively low. Black New Yorkers remain massively underrepresented, accounting for 22 percent of the city’s population but only owning 3 percent of businesses. The report also found that 17.2 percent of young adults, between 18 and 24 years old, were out of school and out of work (OSOW) in 2015, with racial and ethnic disparities in those numbers. Among OSOW youth in gentrifying neighborhoods, black and Hispanic youth represented 21 percent each, while white youth made up 12 percent. Stringer makes a number of recommendations in the report, aimed at connecting economic growth in a neighborhood to its residents. These include creating local network coordinators at workforce development providers to connect businesses with local job seekers; creating uniform assessments to evaluate and prepare job-seekers for the labor market; and assisting entrepreneurs and startups in scaling up their operations and setting up brick-and-mortar establishments; among other proposals. Stringer said this more robust city response to workforce development issues should be part of proposed rezonings that are being studied across the city. The de Blasio administration and local communities are in the process of developing plans to add development, population density, housing -- including affordable units, and neighborhood-specific changes like additional school seats and new parks, for example, to a variety of areas throughout the city. One plan, for East New York, was passed a year ago and is in the process of implementation. Others have moved slowly or stalled, though several, including for East Harlem, may be moving ahead more quickly soon. Stakeholders in the East New York rezoning, including local Council Member Rafael Espinal, pushed strongly for workforce development initiatives to be included in the final plan, particularly the establishment of a city-run Workforce1 career center that opened in December. Similar efforts are also underway in other neighborhoods facing proposed rezonings, with community advocates insisting that jobs created by development should go to local residents. One fear that is prevalent in every borough of New York City is the threat of eviction. Gentrification and the ever increasing housing affordability gap makes staying in an apartment harder and harder each year for thousands of tenants. Evictions are handed down in Housing Court, where the odds do not favor low-income tenants. As of 2015, an estimated 90 percent of these tenants go through Housing Court without legal representation. In attempts to combat this, the New York City government has provided millions in funding to legal advocacy organizations to defend tenants in Housing Court and prevent evictions. As a result, New York saw an encouraging 18% decrease in the number of evictions in 2015 due to the increase in assistance of legal services. While this additional funding is making strides in helping combat high eviction rates, these efforts are not doing enough. 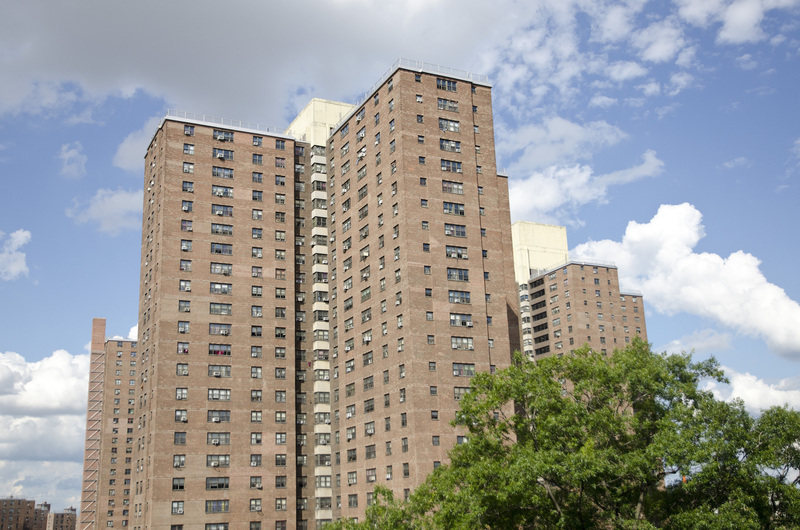 In order to provide real assistance and protection to its low-income residents and tenants as well as reduce racial discrimination, New York City should call for an indefinite temporary moratorium on evictions. In September of 2015, I began work as a legal intern at the Safety Net Project at Urban Justice Center. For nine months straight, I spent hours at Bronx Housing Court with hundreds of tenants, conducting intakes for potential clients for the attorneys to represent in Housing Court. During this time, I realized that one way to address the housing and eviction crisis in New York City could be a temporary moratorium on evictions. In a city plagued with homelessness, a poverty crisis, and drastic rates of gentrification, by instituting an eviction moratorium city government would not only be assisting its low-income residents, but also relieving its overburdened court system and the organizations trying to help tenants. A moratorium on evictions, while it sounds extreme and improbable, would actually be quite feasible and beneficial. Landlords, while not being able to evict tenants, would still be able to collect money settlements. This could take place in Small-Claims, Civil, or even the Supreme Court. During this indeterminate period, New York would be able to reevaluate its current housing crisis and come up with better multi-faceted solutions while thousands would not be threatened with homelessness. The city, not burdened with the cost of both evictions and rising shelter expenses, could shift its focus and funding to other programs such as new or increased housing subsidies. Because of the inadequate number of affordable apartments, new and additional subsidies would allow access to a wider population of New Yorkers, thus diminishing the homeless population. This would result in annual savings at shelters throughout the city as well. Housing Court and evictions demonstrate not only injustice against low-income tenants, but also racial discrimination. If you walk into Housing Court in Brooklyn, the Bronx, Manhattan, Queens, or Staten Island, you see clearly that the majority of tenants are people of color. Approximately seven of every ten clients I spoke to at Housing Court were African-American women. This opens up an even wider conversation about discrimination based on race and gender where black men are locked up and black women are locked out. An eviction moratorium would potentially limit these racially discriminatory practices. Various types of moratoriums have actually taken place all across the country and yielded positive results. In Salt Lake City, a one-year impact fee moratorium was imposed to help reassess the dysfunctional collection fee system. Recently, Oakland, California approved a 90-day freeze on rent hikes and an eviction moratorium to help the city deal with its ever-growing housing crisis. Chicago instituted an official annual moratorium on evictions from December 18 through January 5 to give tenants a holiday reprieve. This moratorium is also in effect when temperatures reach 15 degrees or colder or when severe weather conditions would make it dangerous to evict tenants. Moratoriums like these give cities time - opportunity to assess, reevaluate, and change any facet of policy that negatively affects tenants, recognizing that housing is a basic right and essential to pursuing other aspects of life. New York should be able to institute something similar. Currently, the only existing eviction moratorium in place is the annual and informal practice conducted by marshals, who typically cease all evictions during the Christmas holiday into the new year. However, while this practice is neither sanctioned nor uniformly widespread, it does not address the larger issue of the vast number of low-income New Yorkers who are displaced from their housing each year. 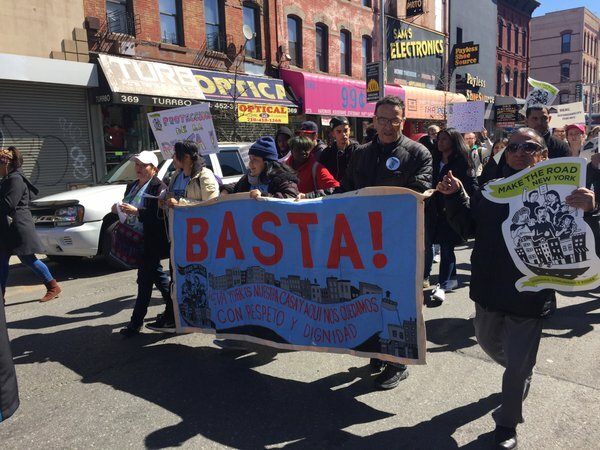 Another eviction moratorium, an official one, took place in 2012 after Hurricane Sandy. While no formal statistics could be found to show the benefits of these moratoriums, both led to more tenants in housing and reduced costs to the city for expenses like shelters. In the fast-paced City of New York, tenants have seen rapid gentrification, judges pushing for settlements instead of fair decisions, and landlords seeking quick evictions. A moratorium on evictions would effectively slow down this process, keep people in their homes, provide more subsidies to put more people into new homes who currently do not qualify, and save the city money. Lastly, New York stands as a beacon of change on many issues. Evictions are a national epidemic. A New York eviction moratorium would act as an example for the rest of the country, thus leading to fewer homeless Americans across the country. It should not take the Christmas spirit or a devastating hurricane to call the city to act in defense of its most vulnerable residents. A housing disaster is already taking place. Tyler Tagliaferro is a double major in Political Science and American Studies at Fordham University. As the mayor‘s recently proposed, and in many cases fiercely opposed, zoning text amendments have fanned the flames of New Yorkers‘ ever-simmering fear of gentrification, one type of at-risk tenant has gone unmentioned: small business owners. Whether it is the famous Arepa Lady of Queens who cooks up corn pancakes with mozzarella, the baby Jesus doll boutique showcased in Frederick Wiseman‘s recent film “In Jackson Heights,” or the local bodega still selling expired $1 honey-buns, locally-owned and servicing mom-and-pop boutiques provide much of the diverse commercial life that has long characterized New York City. As the de Blasio administration looks to change zoning requirements throughout the city, including to allow more and better retail space, and wants to see significant real estate development to increase affordable housing, there is a great deal at stake for small business owners - both current and prospective. In a recent column for City Limits, Meltzer detailed how these local enterprises increase diversity, develop community, and provide economic stability. Yet as rents skyrocket, chains descend upon New York City, and bodegas transform into banks, local shops into Duane Reades. The free market largely dictates these trends, while some continue to call for commercial rent control or, more moderately, adjusting leasing rules to help protect current tenants. With the city economy and population booming and neighborhoods changing, it is increasingly difficult for small businesses to survive. There is little city policy dedicated to protecting these institutions of community character from the ruthless churn of the New York real estate market. Commercial space is treated quite differently from residential space. Discussions around zoning guidelines, tax breaks, and other government policy almost exclusively centers around affordable housing. “There really is no [preservation strategy] that I know of, and I do research in this area.” said Meltzer about small businesses. Benjamin Dulchin, executive director of Association for Neighborhood and Housing Development (ANHD, an equitable development advocacy group), told Gotham Gazette that in one sense, this is understandable. With gentrification on the move in all five boroughs and the de Blasio administration looking to change the rules of the game while also spurring more development, there’s no clear indication about what may be done to protect existing small businesses in the next hot neighborhoods. Meltzer suggests a place to start might be expanding various zoning initiatives designed to support small business and stymy the invasion of national corporations. She listed legislation from the Upper West Side, where former City Council Member Gale Brewer (now Manhattan Borough President) passed storefront width restricts to stop the spread of banks, as an example. So far this measure has been successful. De Blasio’s Zoning for Quality and Affordability proposal (one of the two zoning plans, along with Mandatory Inclusionary Housing) includes allowing for taller first-floor retail space in mixed-use development, but proponents note that the new allowances would still be unconducive to bigger chain stores. Meanwhile, this past summer residents of the Lower East Side proposed a type of zoning amendment already enacted in San Francisco that would cap the number of chain stores allowed in the neighborhood. Meltzer also mentioned “productive zoning” as a potential tool, which instead of mandating spatial inputs like height limitations and store width, focuses on the outputs of the space - meaning what, generally speaking, the space will be used for. This way zoning can mandate retail space goes towards meeting certain communal needs, as opposed to merely stipulating what types of stores cannot be there through measurements. The ZQA text amendment, which is currently under City Planning Commission review and will soon move to the City Council, has some version of each of Meltzer‘s suggestions. City Planning told Gotham Gazette that the retail space permitted by ZQA is not suitable for big box retail (although Target started a program to get around this) and that in certain locations the city‘s FRESH program, which incentivizes supermarket development in health-deficient neighborhoods, will help fill the space. The lack of protective zoning for the small business entrepreneurs of the city, Meltzer says, is only indicative of a larger void in the government‘s supportive framework for those individuals and enterprises. The “institutional arrangement and responsibilities” fall short, she says. To fill the gap, Meltzer argues the government could create some type of bureaucratic infrastructure for retail space oversight - an entity that would have responsibilities comparable to that of the Department of Housing Preservation and Development, but for retail space. Such a body could supply subsidies to businesses when it made sense and assure the spaces these businesses occupied were not being exploited by landlords hungry for profit. Meltzer went on to say that if the city did try something like that, the small business services agency could be the one to oversee it, but none of this is part of the equation right now. However, businesses should only receive subsidies, Meltzer says, if they show adequate interest in adjusting to the changing climate of the neighborhood. There‘s no point in financing an owner who wants to run their business the same regardless of environment. Supporting businesses in transitioning neighborhoods is where existing services provided by the Department of Small Business Services (SBS) can be of use. In a response to an inquiry from Gotham Gazette, an SBS spokesperson said the agency was working to roll out programs targeting these businesses and listed business education and assistance, along with tools to help businesses navigate leases and the retail market as examples. Mayor de Blasio has dramatically cut fines imposed on small businesses across the city and worked, through SBS, to expand opportunities for immigrant entrepreneurs. The administration got a recent boost for its zoning proposals when a dozen ethnic and local business groups, including the Brooklyn Chamber of Commerce, endorsed the plans, as reported by the Daily News. The proposals are being considered by the City Planning Commission before it sends recommendations to the City Council for consideration. Over the past couple of years there has also been clamor about commercial tenant protection, as landlords have been accused of dumping their property taxes onto small business owners and multiplying rents by four or five upon lease expiration. City Council Member Robert Cornegy, head of the Council’s small business committee, introduced legislation in July along with Council Member Mark Levine aimed at curbing harassment, but their bill has not moved. 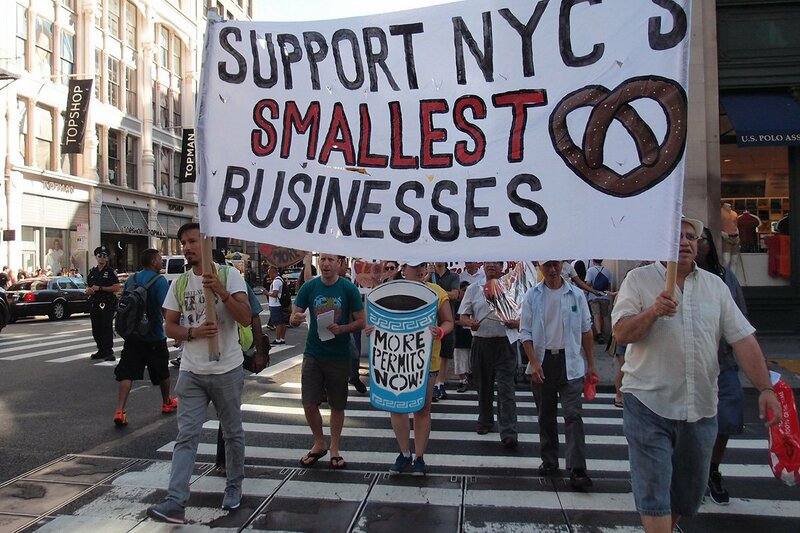 Many small business advocates point to the Small Business Jobs Survival Act (SBJSA), which gives tenants a prodigious amount of lease negotiating power and has been floating around the City Council in various iterations for around 30 years, as the holy grail of business preservation. Manhattan Borough President Gale Brewer, who helped craft the bill while working for Ruth Messinger in the ‘80s, says SBJSA is misguided. Among other critiques, Brewers insists the law would make the lease negotiation process inefficient and there are “serious” doubts as to the bill‘s legality. She plans to propose a more moderate plan with Cornegy in the near future. Ultimately, Meltzer thinks tenant protection and lease renewal negotiation reform are “great,” but that the best hope for strong, long-lasting mom-and-pop commercial retail space stands in how the city negotiates with developers looking to build. As rezoning problems plague some city school districts, leaders in one area of Brooklyn are looking to avoid similar pitfalls while reducing overcrowding. 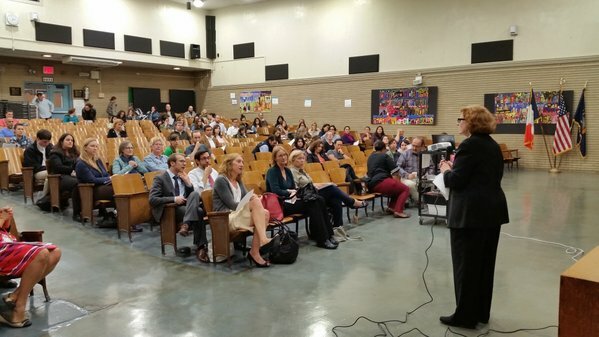 In Carroll Gardens last week, local officials and parents gathered in the PS 58 auditorium to discuss overcrowding issues facing three elementary schools. Like others across the city, District 15 - which includes the schools at hand, PS 58, PS 32, and PS 29 - is facing challenges around booming development and school-aged populations, school crowding and zoning. Wednesday’s forum, featuring several area elected officials, school leaders, and moderated by Professor David Bloomfield of CUNY, was an attempt to get ahead of these issues. “Often when we’re dealing with overcrowding, we’re not able to address it until it’s a full-blown crisis,” said Paige Bellenbaum, a local district leader. A parent of second- and third-graders at PS 58, Bellenbaum noted that since 2005, the school’s enrollment has more than doubled. Bellenbaum and other concerned residents heard from and spoke to a panel of elected and appointed decision-makers. The panel included local lawmakers, Department of Education (DOE) planning officials, the School Construction Authority (SCA) external affairs director, PTA parents with rezoning experience, and others. Amid unprecedented growth and development in District 15 - which contains Cobble Hill, Carroll Gardens, Park Slope, and Sunset Park schools - those who spoke cited the need to “work together in advance to get ahead of the curve,” as Assemblymember Jo Anne Simon put it. City Council Member Brad Lander and State Senator Daniel Squadron, also co-organizers of the event, expressed a similar point. As the district looks to the DOE and SCA to add capacity and rezone neighborhoods, anxiety is high. Local officials organized the forum to begin a dialogue earlier than has occurred in other places facing similar issues. In District 15, the average utilization rate for classrooms is already 111.5 percent. PS 58, its principal explained, has been forced to cap entry into third and fourth grades. “In 2005, enrollment was about 400 students. In 2015, it was 996,” Bellenbaum said. Recently, overcrowding-caused rezonings of four district schools last year and the 2012 rezoning of two Park Slope schools have caused controversy. Perhaps compounding anxiety about rezonings are the current uproars concerning PS 8 and PS 307 in downtown Brooklyn and PS 191 and PS 199 on the Upper West Side. PTA parents from other public schools that had experienced the rezoning process gave advice to parents from District 15 at last week’s forum. Kim Glickman, co-president of the PS 8 PTA, offered her advice to District 15 parents on participating in school rezoning processes. “As leaders of your own schools, you need to be able to understand what the triggers causing the school to be overcrowded are and to be able to speak to them clearly,” Glickman said. Because race and class lines are not as sharply drawn around the three District 15 schools as they are in the other aforementioned school pairings, it is unlikely that a rezoning dispute in the neighborhoods will be the kind of “gentrification battle” seen elsewhere. PS 58, PS 32, and PS 29 were also all deemed either “good standing” or “reward” status by the DOE in its assessment after the 2013-2014 school year. Still, school district rezonings almost always leave some parents frustrated as their home zones are changed and their children are assigned to different elementary schools than they had planned. Although overcrowding has not yet reached a crisis level in District 15, it has had a corrosive effect on its schools, speakers at the forum said. And, given the scale of development happening in the district - the Lightstone Group’s 700-unit residential complex is being built in the PS 32 zone, for example - the creation of many more school seats will be necessary to accommodate all of the students it will likely receive. Already, PS 32 has been using trailers in its rear yard for about fifteen years because of overcrowding. The Lightstone building students (“200-ish” of whom will eventually go to PS 32, according to Council Member Lander) will get seats in the school. A 436-seat annex will be added to the school, Lander and CSA officials recently announced. The annex is also not slated to be completed for a few more years, at which time the rezoning conversation will be at the forefront as officials determine which students are assigned to the new seats. As Community Education Council 15 President Naila Rosario explained with a powerpoint, overcrowding is already having negative effects, including the elimination of enrichment programs, worse building maintenance, and the loss of rooms for art, music, and special services. Though overcrowding appears in many ways as an inevitable result of more people moving into a neighborhood, it is perfectly preventable, according to Leonie Haimson of Class Size Matters, a nonprofit advocacy group. Haimson, who was at last week’s forum and frequently speaks to school capacity issues, says policymakers can take concrete steps to keep overcrowding from happening. “The median utilization rate for elementary schools is over a hundred percent across the city,” Haimson told Gotham Gazette. The problem, she said, is fixable, though there has been a lack of political will. The DOE’s five-year capital plan includes 38,754 new seats for students, a figure that Haimson and her allies believe should be at least doubled. The PS 32 annex is part of that capital plan, and while it will add seats in District 15, it is clear the district will need even more capacity to serve all of the students in the area. A 2014 report from City Comptroller Scott Stringer found that one third of elementary schools in New York City registered at least 138 percent of their capacity in 2012. During February of last year, schools chancellor Carmen Fariña created the Blue Book Working Group, which was tasked to review the space utilization formulas of the DOE’s “Blue Book” and recommend reforms to it. After the group gave its recommendations to the DOE last December, the department did not publish them until July, when it announced that some of them would be adopted. But it rejected the recommendation to shrink class sizes to those outlined by the Contracts for Excellence Law: on average, 19.9 students for kindergarten through third grade, 22.9 for grades 4-8 and 24.5 for grades 9-12. As DNAinfo recently pointed out, Mayor Bill de Blasio promised to abide by these sizes during his mayoral campaign. City school officials were criticized several times at the forum last week in Carroll Gardens. It is up to local elected officials and the de Blasio administration to require public benefits like school seats in development deals. Officials are really only able to do so when developers are utilizing rezonings and other public incentives when they build. The administration and local officials in District 15 are currently negotiating a possible deal with the developer of the former Long Island College Hospital (LICH) site, where a rezoning may be allowed so that a larger development can be built in exchange for public benefits including school seats. Haimson touched on another overcrowding issue, though not one at play in District 15 per se, decrying the state ensuring in law that any newly approved charter school is guaranteed space. “Here, we have this massive overcrowding problem in New York City where there are communities that have waited 20 years for a school, and yet any charter school can snap its fingers and the city has to give them space or pay for their rent,” Haimson told Gotham Gazette before the forum (she also spoke briefly as an audience member during the Q&A). The DOE has faced criticism from Brooklyn residents for its handling of the PS 8/PS 307 District 13 rezoning, among others. Early talks with the department could prevent District 15 from having an adversarial relationship with the DOE when its rezoning process begins in earnest. The purpose of last week’s forum was to get dialogue started so that the lines of communication are open and community input is front and center.